The best time of the year is almost here. Some ski resorts in Europe are already open and others are beginning to open. It can often be difficult trawling the internet to try and find ski resort opening dates. Here at Ski-Lifts, we thought we’d make it easier for you and we did the work for you. Below is a list of the opening dates for the most popular ski resorts in Europe. 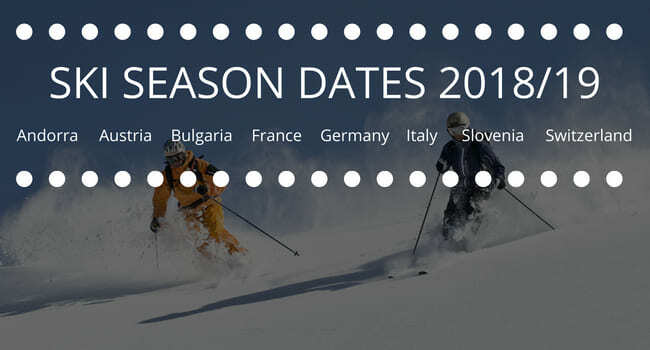 Including; ski season dates in France, Andorra, Austria, Bulgaria, Germany, Italy, Slovenia and Switzerland. Just take a look at the list below to find out when the ski season starts in; France, Andorra, Austria, Bulgaria, Germany, Italy, Slovenia and Switzerland. It’s never too early to book your next ski holiday, so get your woolly hats and boots at the ready, your flights booked, accommodation arranged, ski equipment hired, ski passes paid for and of course, your airport transfer arranged from airport to ski resort. Zermatt – – The Matterhorn, Gornergrat and Rothorn glacial areas are open 365 days per year. Don’t forget you can get an instant quote and book online using our easy to use booking system. New for the 18/19 season, we’re offering new routes in North America with; shuttles from Denver to Beaver Creek, Denver to Breckenridge shuttles, Denver to Vail shuttles, Denver to Aspen shuttles, Denver to Keystone shuttles & many more routes.